here are the only pics i have atm, done on a camera phone so forgive the quality pls... i am a bit of a luddite too so maybe they wont even appear! the point are really just preforms, only one of them has had pressure work done so far, and the knives were more about experimentation, and aren't strictly finished - but when i first took rock to rock, i never thought i'd even get this far in a month of sundays! Still trying to work that out myself (with me, the simpler the language, the better). 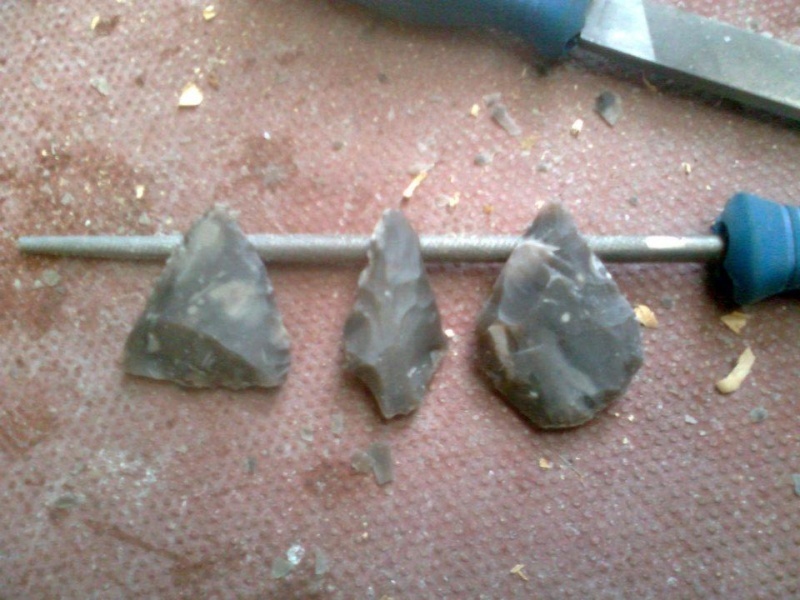 Do like the middle arrowhead, nice shape to it. 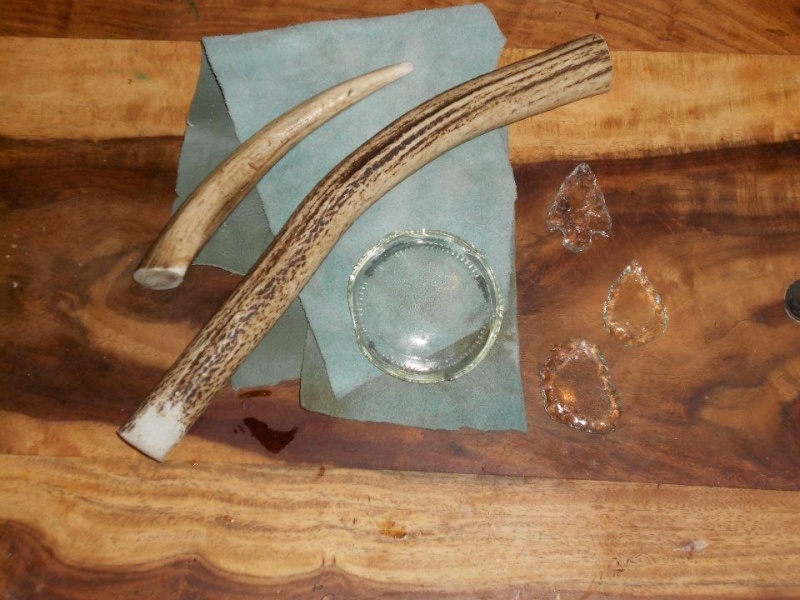 What did you use to fix the point into the antler? Being sort of an 'urban' knapper, I can't always get my hands on more 'natural' products (Anyway, not quite sure about going about collecting natural resin). If you hit the Post Reply, in the top left hand corner, unlike with Quick Reply, you get a toolbar along the top that allows you to do many things including add pics and vids. The add pics button looks like this, , click it and copy the picture address in. Just noticed with the place you uploaded the pics this doesn't work, it turns out the link in the address bar is no good. What I did was right click on the picture then hit the option Copy Picture Link (may vary slightly with different browsers) and did the above using that address. Very nice, the blade on the knife looks really thin, good job, I see you hafted it, is it bound with sinew under the resin? the points are hafted via using a saw to cut a notch vertically down the haft, just wide enough to fit the blade, adjusted with knife or file if need be.. i try to make the blade secure before adding glue - i'll stick slivers of wood inbetween notch and blade (i have a ready supply of shavings and sticks a mile high!) if necessary, then apply pine pitch glue (recipes all over the net, and chaotic fun to make without modern kit) in the cracks, then all over as seen. it also helps to heat blade and haft for the glue to bind really well. i'll *try* do a fuller tutorial at some point if someone doesnt beat me to it, i feel i've learnt quite a bit about hafting this way, having managed to take several autistic students thru the process! the hafts are all wood btw - the "y" shaped one is blackthorn (it has a better blade now, i liked the handle so much i upgraded it) and the other one (shown in hand) was a previously slightly mouldy piece of holly left over from stick making. How does the blade stand up to perpendicular pressure. I've never had much luck with blades hafted that way. I now use a very different method of hafting, I even did a few glue forumala test and wrote an article about it. I'll did it up and try to find it. P.S. Not being a Womble I buy my pine resin on ebay. It's often call rosin, it's used by classical musicians to polish wood instruments and a kilo back that will last years is only a few pounds. Now, why did I write 'antler' when it's obviously wood (put it down to senior moment while typing). Would love to see more info on hafting. I've just made a very basic hafted blade last weekend. The blade is set in the antler using UHU style glue and the inside of some parachute cord. As I said, I'm more of an urban knapper. they hold up well to perpendicular pressure, though obviously i would not use them in quite the same manner (or with the same lack of regard) that i would a steel knife - i would typically support the back of the blade with my thumb, where the glue transitions to blade, when doing such work. that being said, i make sure the blade is very snug in the haft before gluing so i guess that helps. i guess part of the thing is that stone tools are not quite so multi purpose as steel - a good steel knife can do all manner of stuff and take the punishment, but in my experience so far, i would tailor the stone tool to a more limited range of jobs and handle with a little more care.. for example (stone-tool wise) a small adze/axe thingy, a saw-like blade and knife would most likely be needed to fulfill the functions of a good hefty steel knife in a woodland/bushcraft environment. 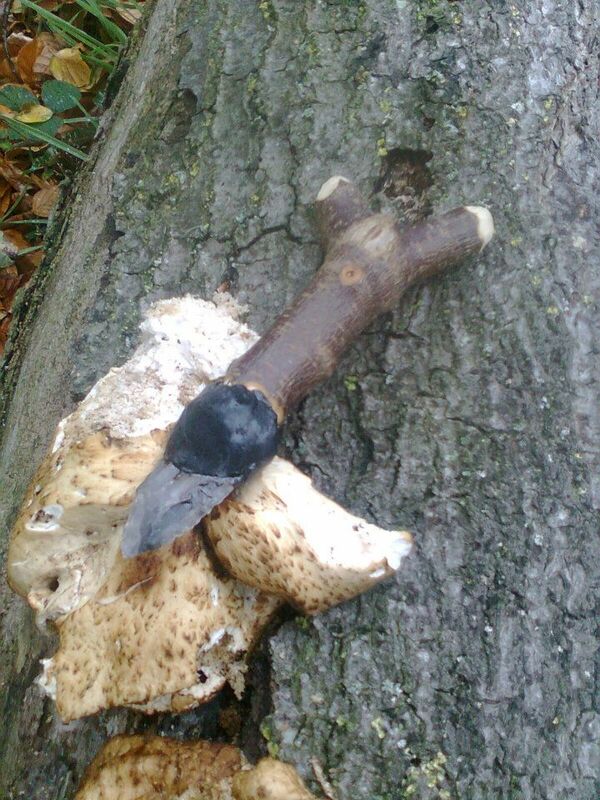 however, if you have a supply of flint to hand, it's much easier, quicker and less complex to craft a new stone knife (an hour from flake to finished, hafted knife if yr lucky and practiced) than a steel one. it's been quite a while since i was on here last, got a new job within the same organisation so i aint teaching any primitive skills atm and i'm like way overbusy! 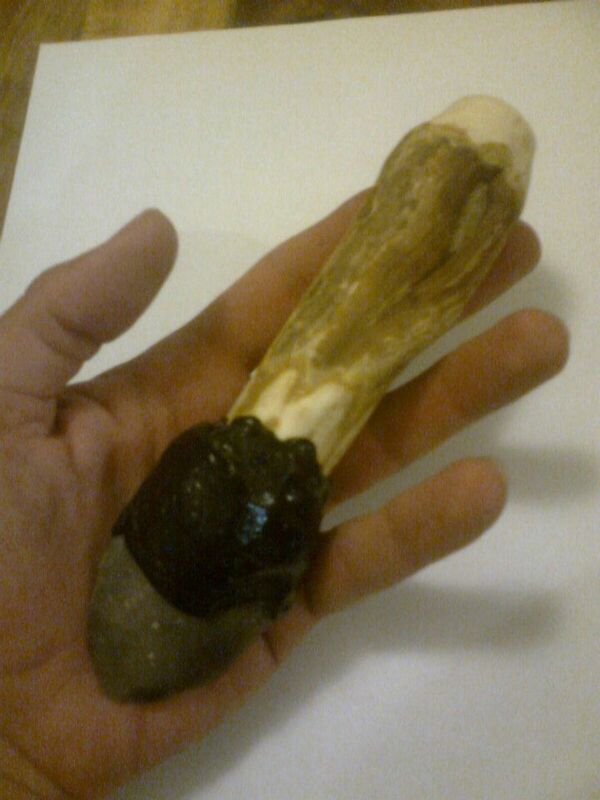 As a result i havent had the time to do much knapping, mainly as would rather knap than spend time spalling from my various lumps of flint - as a result i have been doing other projects like a bit of toy making, spoon making and starting on drinking horns too. 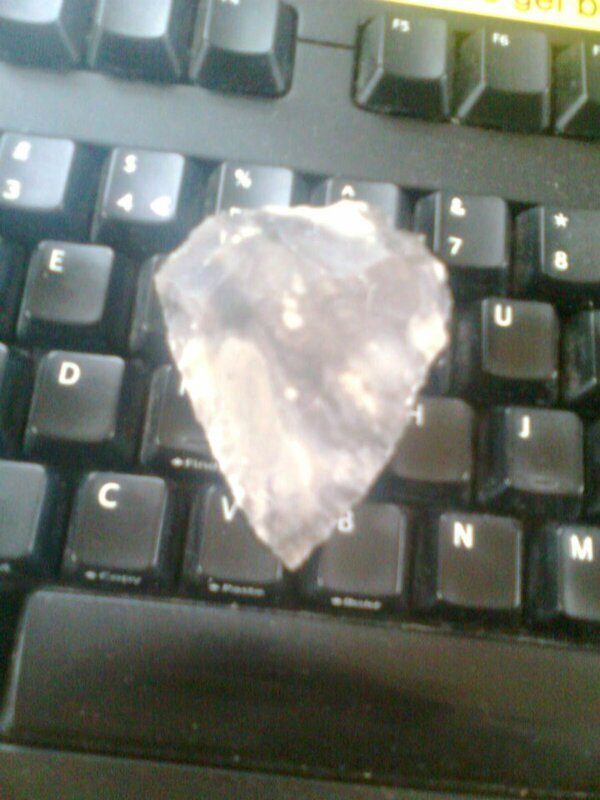 i missed knapping tho and started on some glass from the bottom of milk bottles. 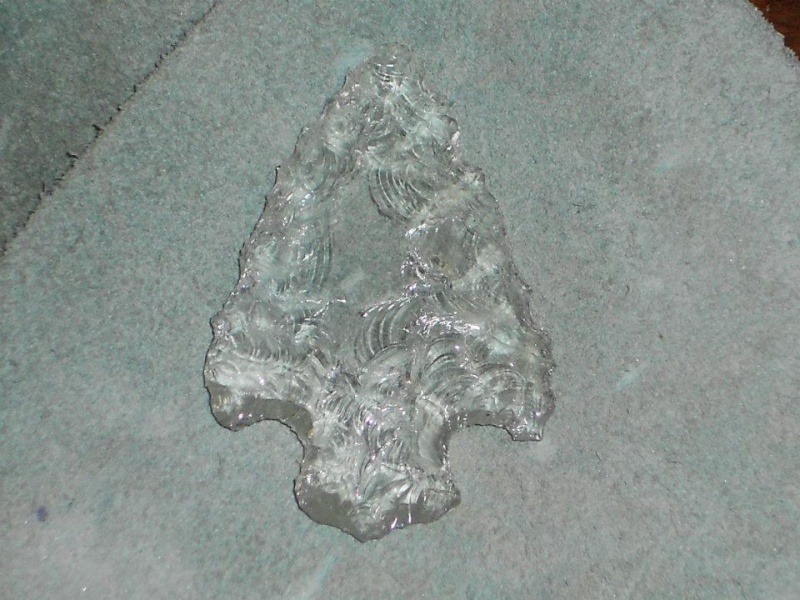 i gotta say, after learning the ropes on flint, making arrowheads from glass was a doddle in comparison and it's so nice spending a spare 20 mins or so making a nice see-through arrowhead, and they make cool gifts too! i've made quite a lot of these now from beer and milk bottles, and glass flakes so easily that i can make them fairly quickly now, i have a tub of preforms/trimmed glass bits and just pick one up in a spare moment or when popping out for a smoke and 20 mins later i have a decent arrowhead! when choosing which beer to buy, i now examine the bottom of the bottle too! That's a nice point, your knapping is coming along well. Did you do it with antler? good man, It's tricky to get going, but it all gets easier given time and good 'ol practice. I will post a picture of my first arrowhead when I find it again! thanks guys, the issue for me is getting the time really and i usually have a few craft/making projects on the go - my outhouse has had a stack of walking sticks in various stages of unfinishedness nagging at me for a few months as well as lumps of stone giving me the eye so it's not always an easy choice. the point was made with entirely with anter too, i had a few lightbulb moments on this one where certain rules and opportunities made sense and i was driven on be a bit more ambitious with it... i'd never attempted a notch or tang before - i'd just really made preforms and leaf shape blades so i was very proud of this one and learnt a lot from it.